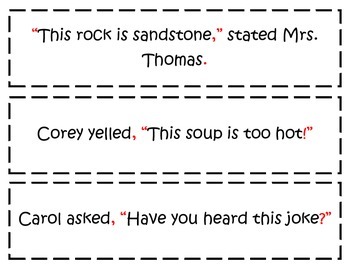 This activity can be used with students to practice the correct use of punctuation marks in dialogue. 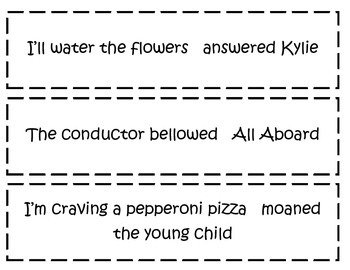 This can be used with a whole group, in a small group, and/or in a literacy center. 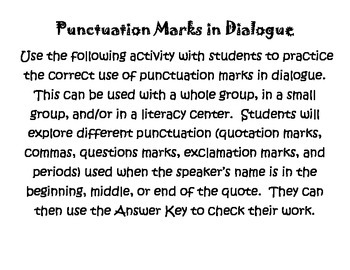 Students will explore different punctuation (quotation marks, commas, questions marks, exclamation marks, and periods) used when the speaker’s name is in the beginning, middle, or end of the quote. They can then use the Answer Key to check their work.